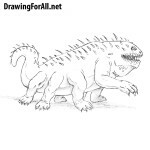 Hello everybody and welcome to Drawing For All. 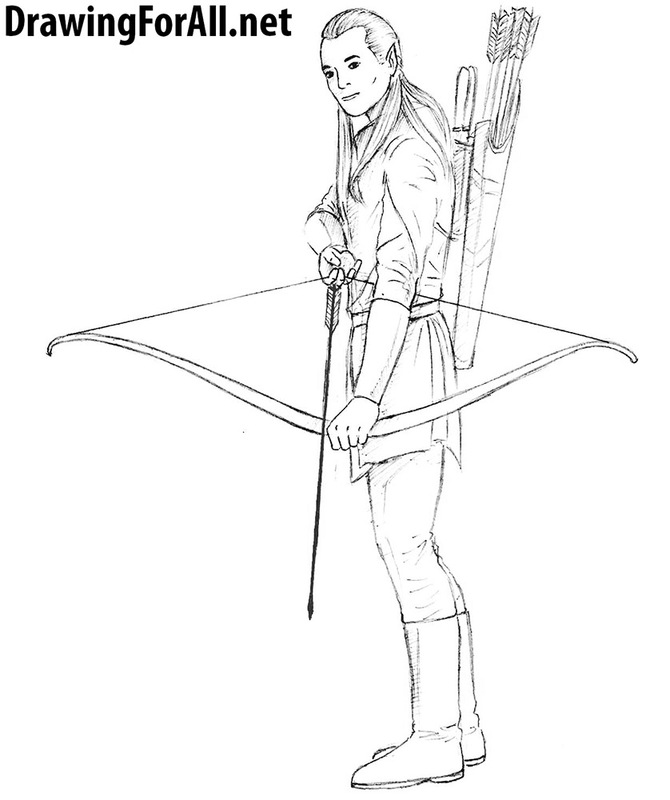 Today we continue theme of fantasy and show you how to draw Legolas. 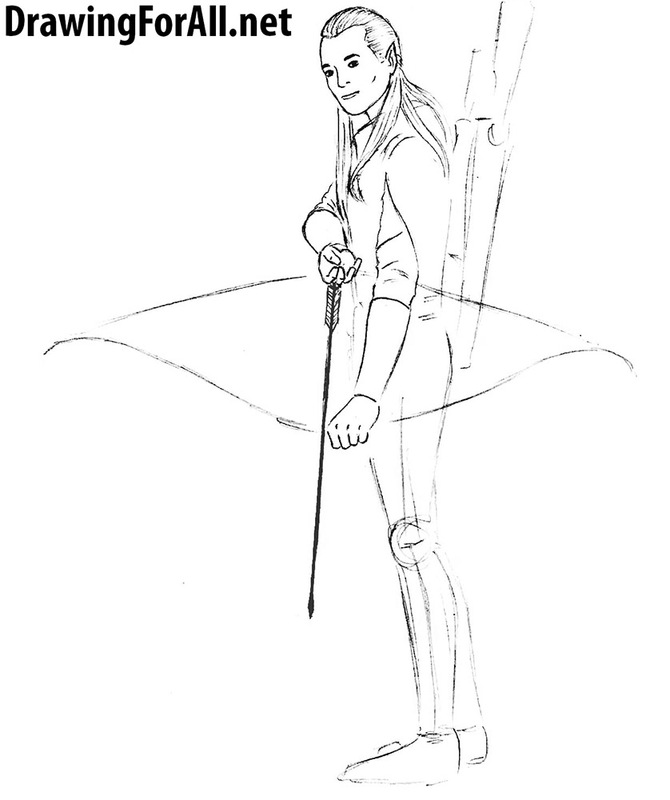 Our Legolas stands in a very standard for him position with a bow and arrow in his hands. So, draw the head in the form of a normal oval. Sketch out the lines of symmetry of the face. 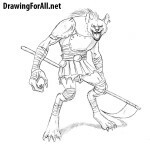 Then move down and sketch out the spine, arms and legs. Try to make the lines light and smooth. Now let’s add some volume to our elf archer. Draw the neck in the form of a cylinder, then the trunk. Draw arms and legs in the form of elongated cylinders, shoulders and knees in the form of circles. Let’s start adding details to our Legolas. First of all draw the eyes on the horizontal line, then the nose and mouth. Draw the hair and ear. Continue drawing the face. It is very simple step. Draw out the eyes with pupils inside. Erase all unnecessary guidelines from the face. Make the lines of the face clean. In this step we will finally finish drawing the face. 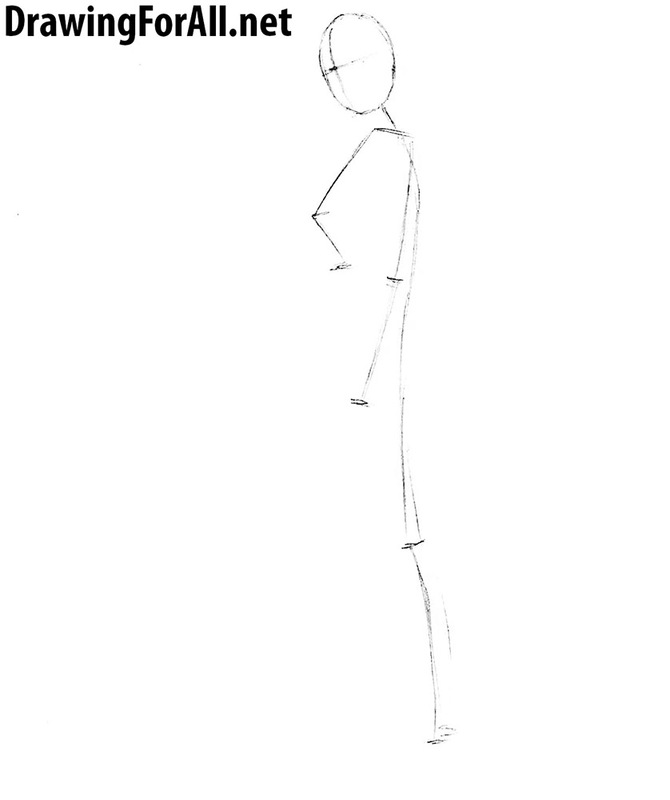 Using short lines draw the hair. Make the ear sharp as in our example and add lines inside the ear. Carefully draw out the from arm of Legolas. Draw out the suit and add all the necessary folds of the fabric. Draw the bracer and the fist in which in the future we draw the bow. Continue drawing the arms. In this step we draw out the rear arm. Carefully draw out the hand and arrow in the hand. 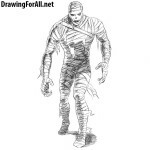 Draw the visible part of the torso and add some folds. 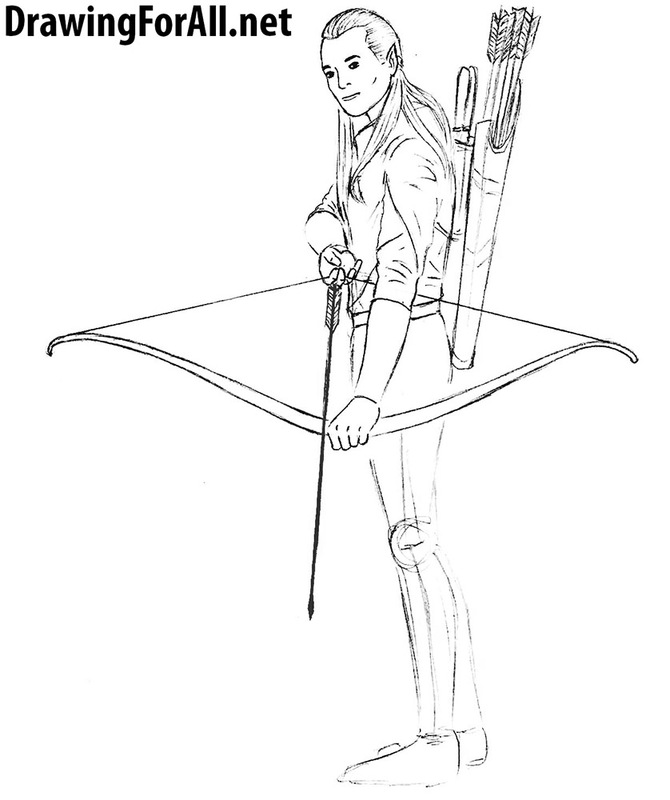 On the back draw a quiver with arrows folded in it. Using very smooth lines draw out the bow. This step seems rather complicated, but in fact it is not. Draw out the clothes hanging from the belt. Next, draw tight pants and add wrinkles as in our example. At the very end of this step draw out the boots with folds in the area of ankles. Here we will add shadows to our Legolas. The shadows here are made in a realistic style. With the help of very light lines draw the outlines of the shadows. 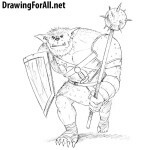 Next using very light hatching add shadows inside the outlines. 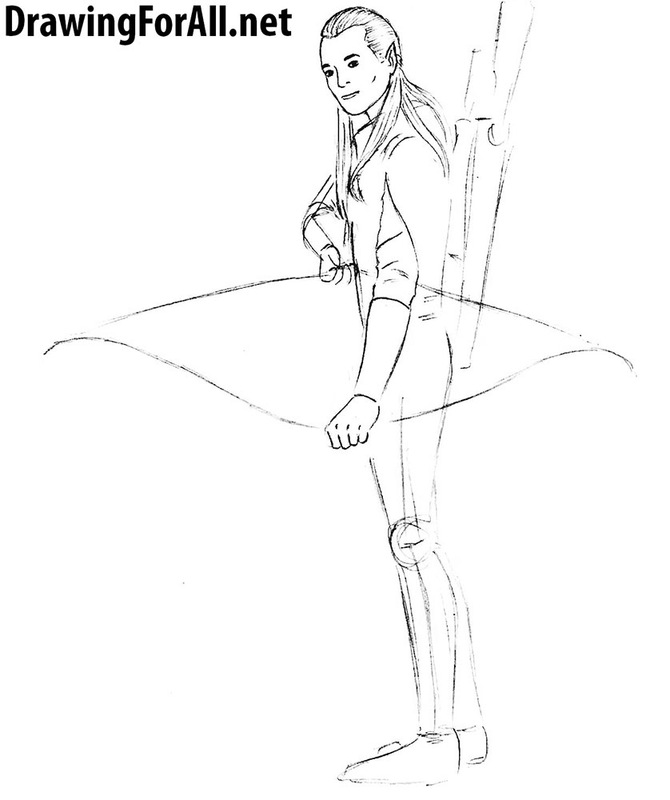 A lesson on how to draw Legolas from the Lord of the Rings came to an end. 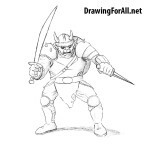 Do not forget to visit our category “Myths and Legends”, where you will find drawing lessons about dwarf warrior, wizard and many other fantasy drawing lessons. Also don’t forget to share this and other our drawing tutorials and subscribe to us in social networks.